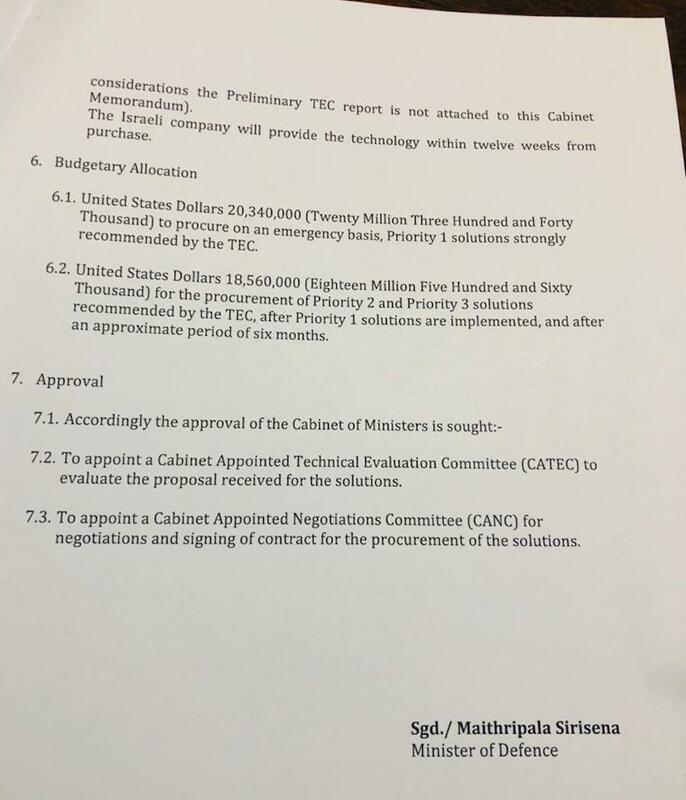 President Maithripala Srisena in his capacity as the Defence Minister has sought cabinet approval to purchase USD 38.9 million (Rs 6,924,200,00 – on today currency rate ) worth of interception equipment from an unnamed Israeli company bypassing transparent procurement procedures while keeping cabinet in the dark. “They are two issues here: first, why can’t the President disclose the details to the Cabinet? 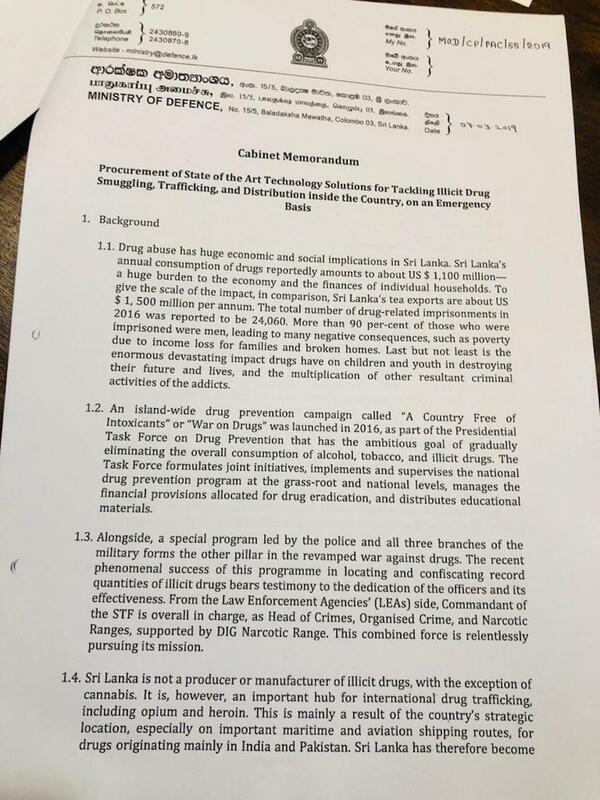 The second is that considering drug trafficking or the number drug users, the number of phone, social media users, one has to wonder if this is for a mass mass surveillance program,” an informed source told Colombo Telegraph. At the end of the last year, the European Court of Human Rights ruled that the UK government’s mass interception program violates the rights to privacy and freedom of expression. The Court held that the program “is incapable of keeping the ‘interference’ to what is ‘necessary in a democratic society'”. This finding is an important victory for human rights and the rule of law. It concluded that “[i]t would appear that analysts could search and examine without restriction both the content and the related communications data of these intercepted communications. We have come to accept the big big dealers are treated differently from the small fry peddlers. What happened to the recent large interceptions? The dealers and the haul? If tourists are apprehended, will they be hung? If not, why? The expensive interception equipment may be made inoperative by human intervention. The real problem is the ‘Culture’ of corruption/nepotism/impunity. 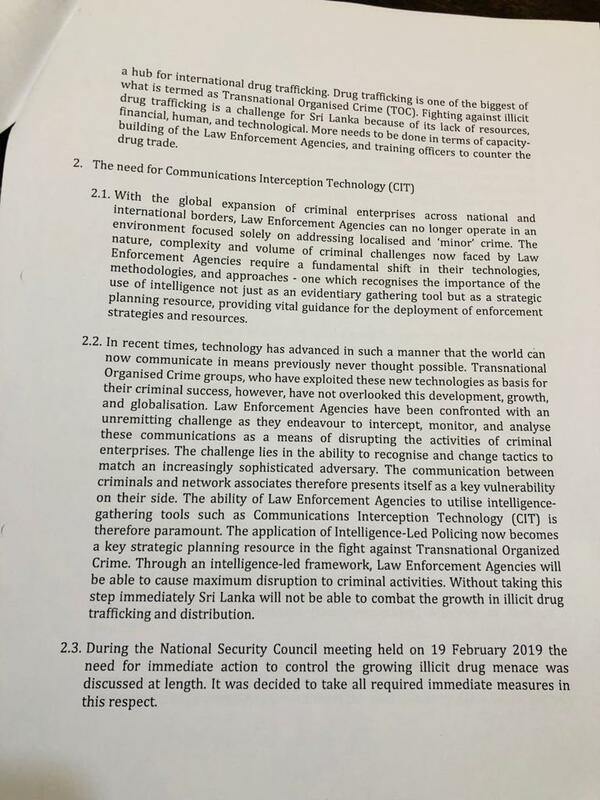 The so called drug war is a cover for the US to militarize and implement massive surveillance of Sri Lanka in its Cold War against China. Oman;s Minister in in Colombo because Oman’s Thumrait air base (IATA: TTH, ICAO: OOTH) is a military airport located near Thumrait, a town in Dhofar Governorate, Oman. The United States Air Force is a major current tenant of Thumrait Air Base. This Southern Economic zone project operated by Ranil’s pretty boy Sagala is a to control Lanka’s coast for submarine landings. That is why poor people’s livelihoods are being destroyed by clearing their small beach hotels for the US military plan in the South of Sri Lanka with supports from Trumpland puppet Bondscam Ranil to get going. This is a Land grab by the US that is why suddenly title deeds are being distributed to Lankans by Ranil. Nilan Fernando, another diaspora guy, like Perpetual Treasuries fraudser US citizen Ranjan Hullugalle, and ICTA Kanagay and Singapore Mahendra, was with Asia Foundation which was set up to weaponize Buddhism during the Cold War long ago, Fernando has now with MCC to run the CIA op in Sri Lanka at this time and the Peace Cops will soon be sending a massive invasion of 150 “volunteers” with diplomatic immunity to fix elections and man social media fake news in lanka. What BS you re bubbling ? If anyone sold lanken properties it was FORMER so called KING, Mahind Rajapakshe, having sold a plot of land to SHANGRILA company. Thanks to Sirisena-Ranil GOVT, they were able to convert it to a lease. You the kind of back lickers of Rajakashe brutal men, would spread any lies thinking that they are the leaders to this country. But those who know it, the stupidity of Rajakshes and his adminstration should be made accoutable for the chinese debt trap. Besides, Chinese has done it to very many kind of in Africa… most where they found stupid men as the leaders. Mahinda Rajaakshe is the most stupid leader we the independent srilanka ever produced. These morons, not knowing the bit well, make every effort to put the blame on RANIL for all the loads of their shits, deliberately made to this nation. Rajakashes should be hung by bringing to galle face green if at all we the nation to feel fine. Irrespective all the fund related crimes, deliberately made to this country, they further abuse the very same to grass eaters dominated nation for their political surivival. Falsified informaton by abusing PRVATE TV channesl such as Derana, Hiru, Sirasa and Swarnawahini are their media propaganada until people would realized that they are caught by the MEDIA mafia run by Rajakshes. Please get yourself how Rajakashes got caught by Chinese Debt trap… not only SRILANKA all other tribal leaders in AFRICA are caught. This Sillysena has told he would hang the Drug traffickers who happened to be his close friends, relatives and associates. I bet no president, in the past, present or future would had or would have the guts and moral qualifications to hang any criminal. Sri lanka is THE paradise for the CRIMINALS. Yesterday Lankawe signed a deal with China for$1 Billion loan. About one and a half years ago Ranil said that as he didn’t have money to repay about $1B loan Old Royal took from China to modernize the Hangbangtota harbor, China had forcefully taken the harbor. But now Ranil played again this new loan game from China after he dodged the bullet at UNHRC 40th sitting. This is how he did the Hangbangtota sales too. He invited PM Modi to preside the International Buddhist day (UN Vesak). In may Modi opened a free hospital Indian Government built. Right after that Ranil sold the Hangbangtota Harbor to China, in October. Everybody contented the harbor sale was about the Chinese Veto at UNSC, but not loan pressure. Ranil was long planning to take on West, from the time he met Old King in Temple Tree House on the election night. He expected West to Punish Old King through UN & UNHRC. He was preparing China for a showdown in UNSC. But Rupee’s declining told him a lesson that West doesn’t need UNSC. He appeared to be run out of strategies to continue his cold war with West. The Trio’s joint operation of Coup was a short cut to handover some power to Old King to deal with West on the War Crime. When the Coup was defeated, Old King and New King were in serious violation of Constitution. Now, additionally, Ranil had protect them on that too, So he ordered to withdraw the case the 122 MPs filed at CoA. Now after the UNHRC 40/1, he has declared that he did not consent for International Participation in any investigation. But this is what the resolution 30/1. He has renewed the Veto deal with China by a new $1b loan. If West screw up more on Resolution 30/1, Ranil will sell the roads to China for the loan and renew the veto deal. So this is where the money will come for the next Presidential election campaign of the worst President this country has seen so far. How can any cabinet paper be approved without the name of the supplier, brand of the equipment and warranties provided by the manufacturer/supplier, unless its a conditional approval that the full details should be provided before the final cabinet approval. If the President wanted a final approval now, it means there is bribery and corruption involved. We can guess the route through which this bribe will be channeled as well. 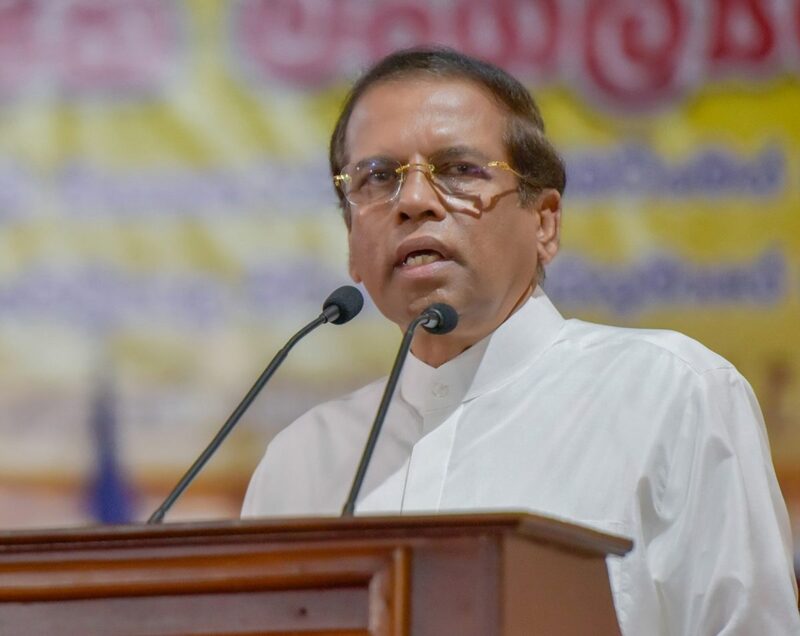 My strong guess is this business project is multipurpose; 1: Set up Maithripala Sirisena and black mail him; 2) he can be defeated in the next election; once black mail, he will do what ever he was asked to do. They have set up so many TRAPS in Sri lanka to Catch Sri lankan politicians. They will earn some big money for a completely unwanted equipment. the world knows that the INTERNATIONAL community is Treating Saudi Arabia that way. Even after This much Oil sales which comes from the Earth, Saudi Arabia is not that rich. All that money was dropped as bombs in poor countries as bombs. How. We should go back to the days of the (European) ancestors of some of us in Sri Lanka, when we gave opium to the Chinese to lead them astray. Our ancestors did not care about the Chinese emperor’s protests and actions against us. We fought wars to protect our ‘right’ to sell drugs to Chinese citizens. Now we find the same tactic employed by middle eastern, devil worshiping religions deployed against us. What role does Israel play in transporting drugs around the world, and in programing the brains of idiotic murderers like the recent crp heat in New Zealand and supplying them with weapons to murder Muslims? Wake up people, See reality as is. 1) Hang all the drug dealers, as you have said. 2) Divert these funds to rehab all the tanks and water-ways in the island. 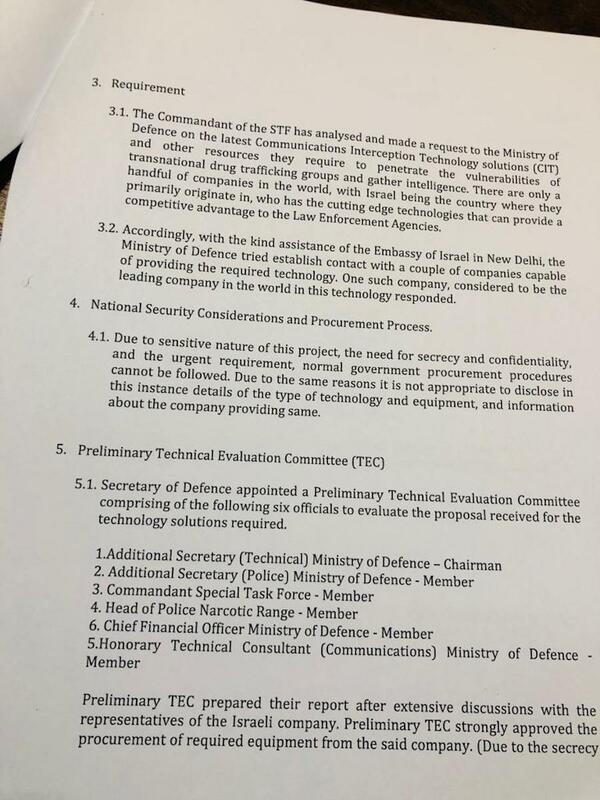 In most of the countries, a court order is necessary to intercept private communications. Further, Israel is a country which sells missiles to governments and anti-missiles to terrorist outfits. The Presidential term is coming to an end in a few months. After all these years, what is the reason for this sudden awakening? This is not about drug trafficking, is it? Most of the politicians become desperate and agitated when their time is up. As this technology is unregulated, it can easily be used against opponents. Or may be these security instructions are coming from a phantom. Sri Lanka should introduce Electronic Communications Privacy Act with immediate effect. This equipment is for mass spying on the population. The Prez is determined to hold on to power by hook or by crook. Much more things to do with this money. Many ways to tackle the issue. Only let the police and narcotics authorites to handle the issue with out interference . They will do the needful. They’re clever enough. If this is for RADAR or for Remote Sensing equipment, still it is a wastage of money. If it is RADAR they manufacture even RADAR detecting equipment. So, need to be careful. Can’t imagine why people responding to this news article end up talking about the Bond Scam. I see no relevance whatsoever. Sirisena is trying his best to earn a fast buck knowing his days are numbered. Ranil as usual doesn’t have a back-bone to say no to the crooks around him. He will go down in history as the dirtiest Mr.Clean to rule the country.